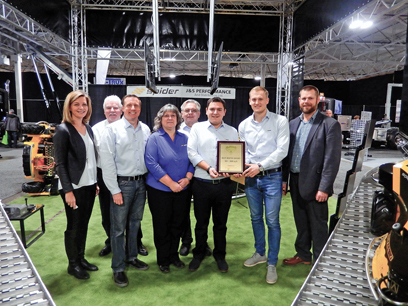 J&S Performance, the family-owned Canadian distributor of Spider remote-controlled slope mowers, had a very successful expo at the Landscape Ontario’s Congress, culminating in the award for the best booth in the 37-74 m2 category. The award-winning booth at the expo, held at the Toronto Congress Centre early this January, featured a selection of Spider’s unique 4-wheel drive, 4-wheel steer multi-terrain mowers and attracted a very healthy number of visitors during the 3-day event. Manufactured in the Czech Republic by Dvorak-Svahove Sedkacky S.R.O., Spider mowers are built to tackle the tasks that are considered too dangerous for operators to complete alone. They can climb slopes up to 55° with the assistance of an integrated stabilizing winch and are able to cut down all vegetation that the machines can push over. With safety and productivity in mind Spider mowers are an affordable option that keeps operators safe, while keeping jobsites maintained to the highest industry standard. Source: J&S Performance and Distribution Ltd.